There are days on which it’s inadvisable to fly into the Sierra Nevada. But for anyone still wishing to visit Yosemite National Park, or travel anywhere in the vicinity, the Mariposa-Yosemite Airport is a good alternative. Built during the Second World War as Mariposa Air Force Auxiliary Field, it’s a pleasant strip lying at an altitude of just 2,252 ft. at the foot of the Sierra, surrounded by gentle hills. You can hire a car here (enterprise) to drive further up into the mountains. 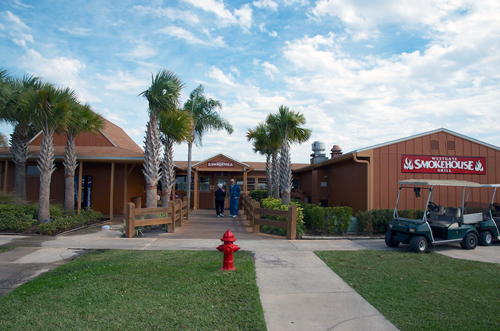 The Airport Bar & Grill is only a short distance away to the west on Highway 49. This Western-style restaurant serves simple cuisine at fair prices. Around 8 miles from Mariposa-Yosemite Airport, there’s a cozy B&B called the Mariposa Farmhouse. Guests are picked up from the airport free of charge. 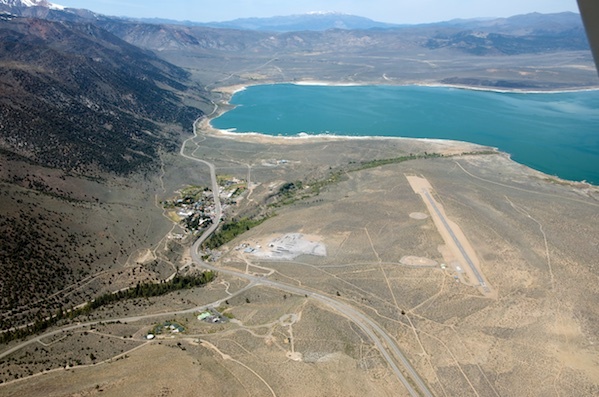 Lee Vining Airport lies on the shore of Mono Lake, to the east of the Sierra Nevada. 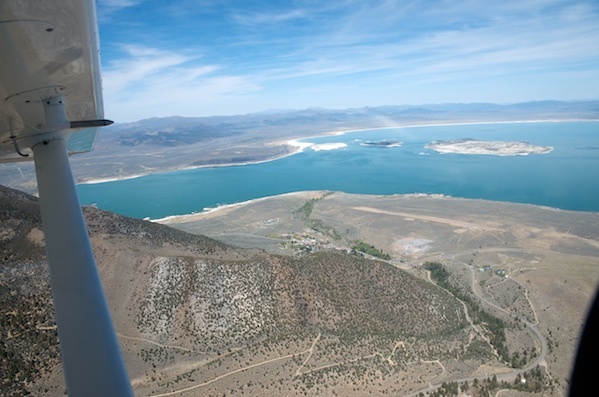 A saline soda lake, Mono Lake is one of the most interesting natural phenomena in California. Mono Lake is believed to have formed at least 760,000 years ago, and the lack of an outlet has caused high levels of salts to accumulate in the lake over the course of the millennia. This has resulted in an extremely unusual ecosystem in which only a few species of animals and plants are able to survive. One of the few animals to thrive, the brine shrimp, is a staple food for the migratory birds. These shrimps feed on single-celled planktonic algae. In the early spring, when winter runoff brings nutrients to the surface layer of water, these algae reproduce so rapidly that the water of the lake turns as green as pea soup. Its shoreline is dotted with bizarre limestone formations called tufa towers. These were exposed when a 350 miles long aqueduct was connected up to the lake in the 1940s to meet the growing water needs of Los Angeles. This has caused such serious ecological problems that efforts to slowly raise the water level again have been ongoing since the 1980s. There are several ways you can approach Lee Vining from the west, but the most spectacular route is definitely down the Yosemite Valley and across Tioga Pass (almost 10,000 ft. high). Every pilot is aware of the careful attention that must be paid to the route and weather for such a flight. Your reward, however, will be one of the most thrilling aeronautical experiences to be encountered in the whole of North America. 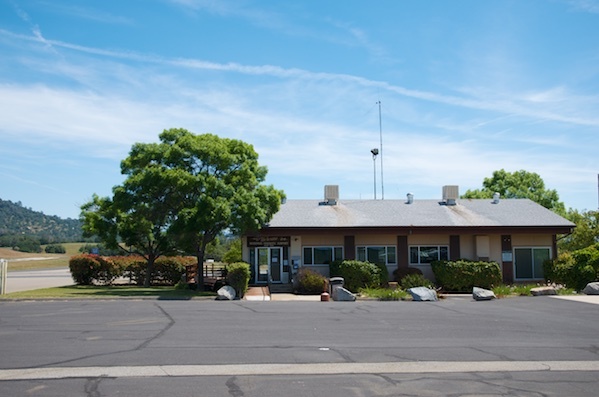 Anyone who wants to know what a mining town looked like during the California Gold Rush, and how the “forty-niners” prospected for gold there, should definitely pay Columbia Airport a visit. 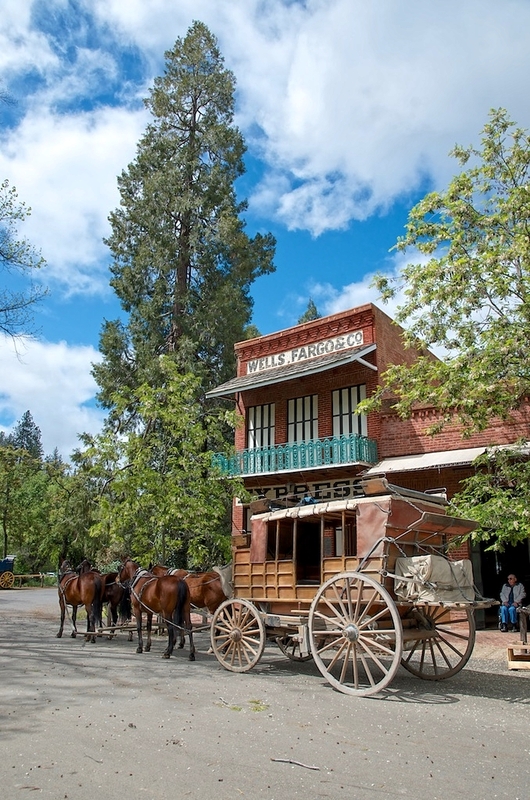 In the 1850s, Columbia was regarded as the most productive gold-mining town in the West. Although the boom quickly fizzled out after 1858, Columbia was able to avoid the fate of other mining communities and never became a ghost town. There are a number of carefully restored historic buildings dating back to this period. Today, you can stroll along the main street and admire old-style shops and tradesmen’s premises while a stagecoach rumbles past you. You can even try to pan for gold yourself and learn how difficult it was to wash the precious metal out of lumps of solid clay. Maybe you’ll find enough gold to pay for your aviation fuel! There’s a small footpath leading from the airport into town, and it takes about 10 minutes to walk. If you catch a severe dose of “gold fever”, there are several places in town where you can stay overnight. 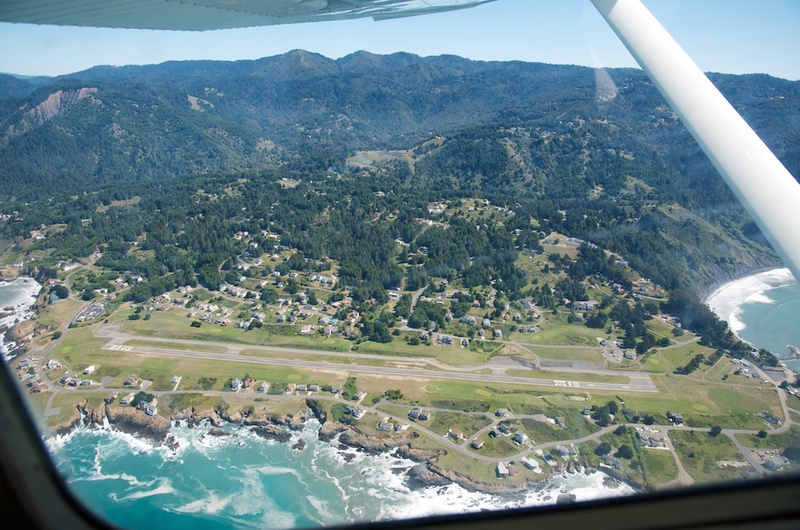 Shelter Cove Airport is a jewel among the airports of Northern California. 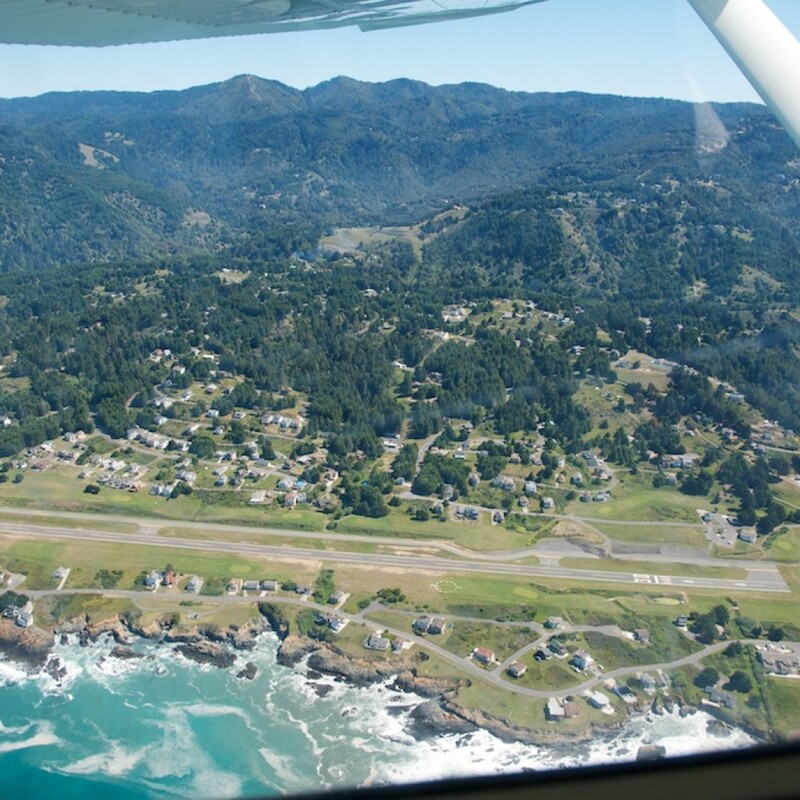 The airfield is perched on a small promontory that juts out into the Pacific, and both ends of the runway are only a few feet from the water’s edge. The best way to approach the airport from the south is to fly along the coast. Depending where you start, try not to miss the Buddhist temple complex, with splendid buildings and golden domes, situated about 2 miles inland from the sea, almost exactly on a level with Healdsburg (KHES). It’s marked on the charts simply as “temple”, but this hardly does justice to this huge set of buildings. In Shelter Cove, you land practically in the middle of a 9-hole golf course. 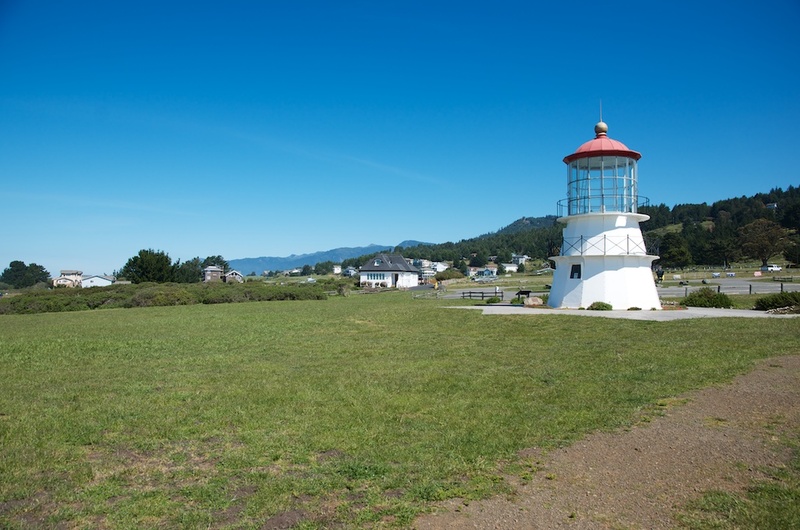 The old Cape Mendocino lighthouse, dating back to 1867, is only a few minutes’ walk away. The whole area is a haven of solitude and tranquility. Shelter Cove owes its relative isolation to the steep cliffs that caused the constructors of Highway US1 to leave out this section of the coast. To this day, it remains only accessible by means of an extremely narrow, winding mountain road, by boat, or by air. 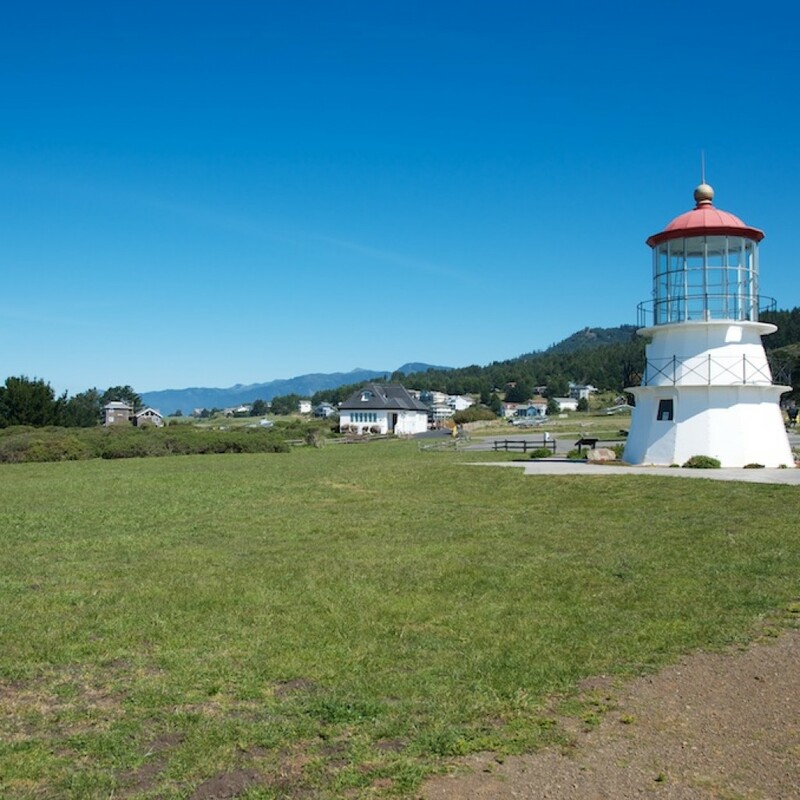 If you’d like to spend more time enjoying the peace and rugged charm of Shelter Cove, there are two places to stay overnight situated right next to the airport, Ocean Front Inn and Tides Inn. Oglesby and Company Auctioneers, in cooperation with Ace Realty Advisors, have announced the auction and complete liquidation of Chalet Suzanne. The auction is scheduled for two days beginning at 11 AM, Friday, February 27, 2015, and ending the afternoon of the following day. 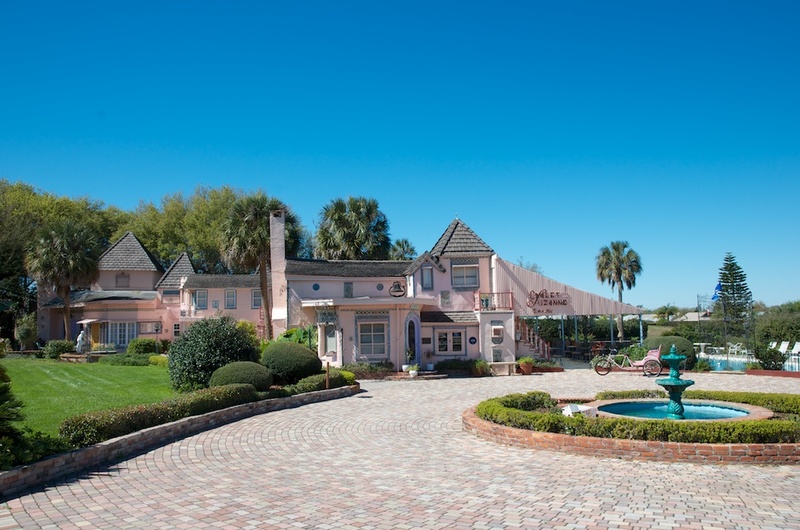 Chalet Suzanne – famous not only among pilots – includes a restaurant, inn, airstrip, cannery, and vineyard, spread across 130± acres of manicured, pristine land along the Lake Wales Ridge in Central Florida. A destination for tourists and locals alike, this property has been operated continuously by the Hinshaw family for 83 years. 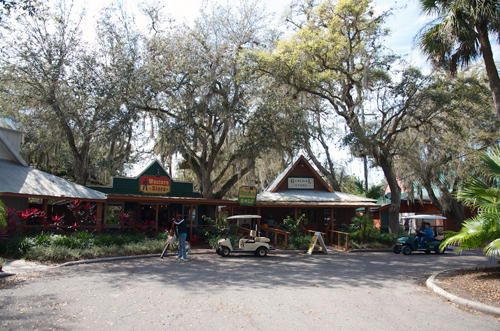 Located at 4000 Chalet Suzanne Drive, it is the largest block of Tourist Commercial land available in Central Florida. A favorite destination of celebrities and business people alike, Chalet Suzanne has hosted Burt Reynolds, Johnny Carson, Dolly Parton, NASA Astronauts, as well as many, many other notable people from the U.S. & abroad. The auction will include all of the real estate holdings, personal property, FF&E (furniture, fixtures & equipment), aircraft, souvenirs, and intellectual property including the recipes, licenses and guest logs. Most of the real estate and personal property is to sell absolute to the last & highest bidder(s). We can only hope that this great destination in Central Florida will very soon be open for business again. see from the air where this region got its name from. This unique landscape made up of thousands of small islands stretches over a distance of 25 nm – starting with Marco Island to several miles south of Everglades City. If you’re lucky enough to fly over this labyrinth at sunset, you will be treated to a light show, the likes of which you will never have seen before. 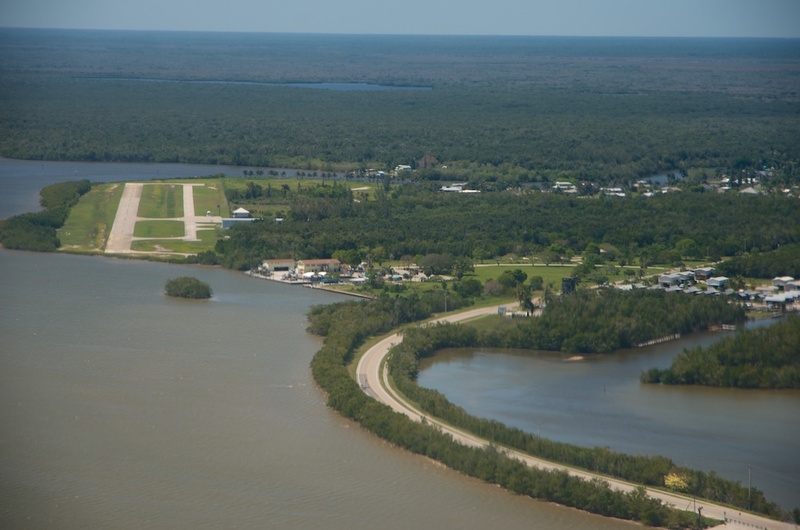 With a runway length of just 2400 ft, Everglades Airpark has one of the shortest runways in Florida. 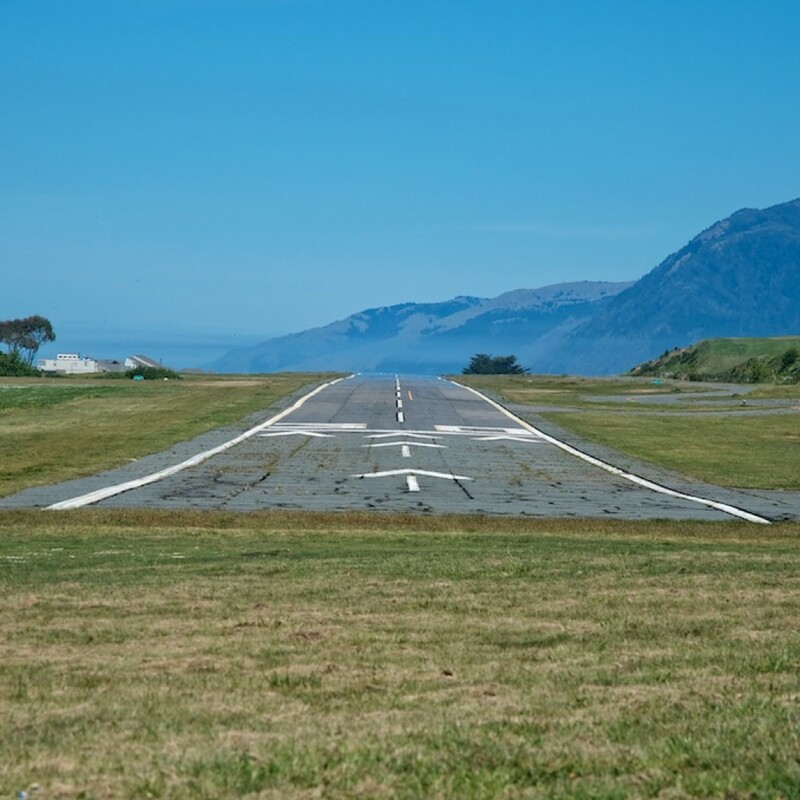 Even if most European pilots are used to such short runway lengths, it’s better to err on the side of caution because its proximity to the sea and a group of trees to the west can cause windy surprises. Once on the ground, this airfield will seem like the last outpost of civilization, which is rather unusual for Florida. There are no traffic lights or taxis. Golf courses or shopping malls? That’s a negative! Instead, you can experience nature at its purest with all kinds of outdoor recreational activities. The FBO has brochures and fliers from most of the local tour companies and tourist attractions. I recommend picking a place first, because this then determines whether you will turn right or left at the end of the road leading out of the airport. 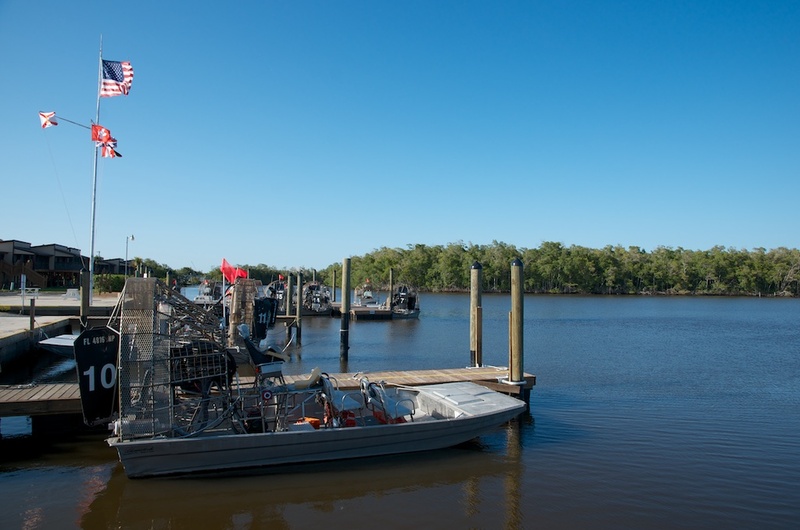 Some airboat operators and restaurants also provide a shuttle service, which can be a good option depending on your sense of adventure, especially during the hotter time of year. Turning left takes you into town, turning right takes you to the Everglades National Park, to Glades Haven Marina and to the Oyster House. It’s about a 10-minute walk to get there. are definitely a genuine experience. 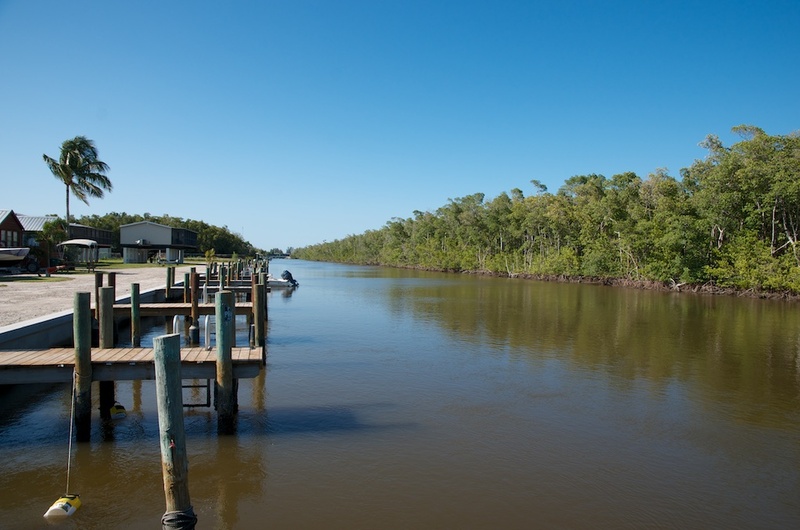 If you’d prefer exploring the region on your own, you can rent kayaks or motor boats at the Glades Haven Marina. However, the motor boats are rented out only on a day basis, not per hour. If you want a snack before heading out on a tour, the place to go is the Oyster House which serves all kinds of seafood as well as steaks. I highly recommend trying the stone crab, which is found mainly in the Gulf of Mexico, or alligator. Located right next to the restaurant is a wooden observation tower where you get a great view of the Mangrove landscape. If you walk out of the airport and take a left, you’ll reach a main traffic inter-section after about 15-20 minutes where you’ll see the Everglades City town hall at the north end of town. Take a right at the intersection and after a few minutes, you’ll see the Raw Bar restaurant, a rustic structure built on stilts where you can enjoy refreshments right on the water. Boats belonging to several airboat tour operators are also moored here. Right next door is the Seafood Depot. nutes. This restaurant also has a patio right on the water. Some guests arrive here by boat or seaplane. The Triad is very popular and well-known beyond Everglades City. It’s best to call in advance to check opening times and to reserve a table. (+1 239 695 0722). You can also request pick-up at the airport. It is always worth asking! Held each year at the beginning of February is the Everglades Seafood Festival, an event that’s not to be missed. 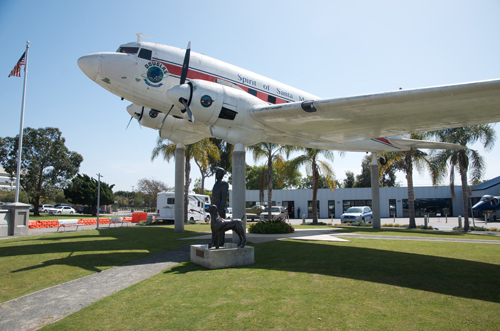 Although it’s hard to believe, there really is a general aviation airport right in the center of Los Angeles, in Santa Monica to be exact. 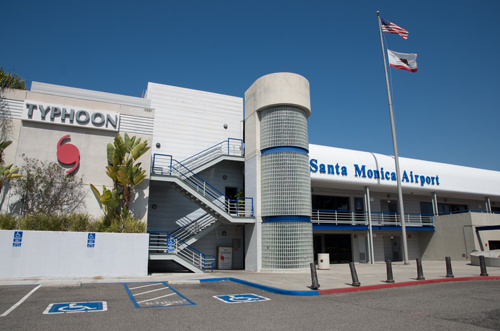 Santa Monica Municipal Airport is located just 5 miles north of Los Angeles International (KLAX). How long Santa Monica airport will continue to be there is pretty hard to predict though. Due to the premium location, the land it stands on is of immense value to real estate investors as well as pilots. This uncertainty about its continued existence is one more reason to fly there as long as you are still able to. It’s only a short trip from the airport to downtown Santa Monica or Venice Beach. Due to the complicated airspace structure, it’s always advisable to obtain flight following for landing at Santa Monica. Pilots approaching from the south can take the Mini Route directly across the threshold of LAX’s runway 25. 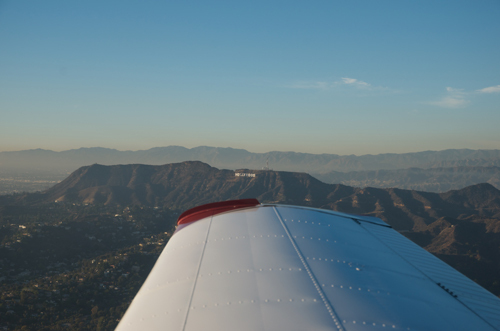 For detailed information about the VFR routes through LAX’s airspace, please consult the Los Angeles TAC. Make sure you also comply with the noise abatement regulations governing take-offs. 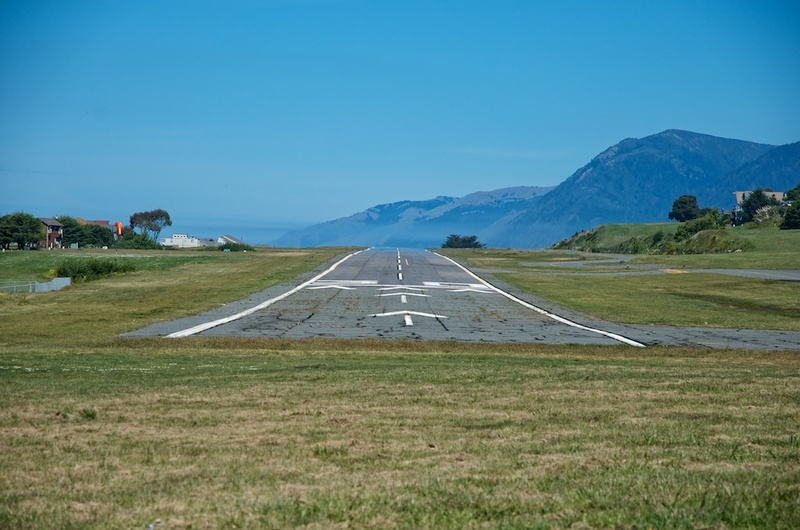 You will need to pay a landing fee to use this airport. This fee is payable in the administration office in the terminal building. Here you will also find one of the best airport restaurants in California, the Typhoon, serving mostly Asian cuisine. If you’re planning to eat there on the weekend it’s best to reserve a table beforehand. On the opposite side of the road from the terminal building, there’s a second restaurant called the Spitfire Grill. This is a great place to have breakfast. Right next door to this restaurant is the Museum of Flying, a place that’s really worth a visit. 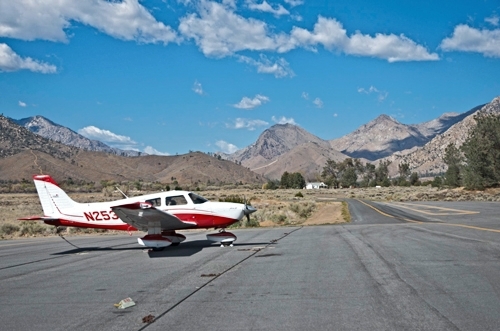 Kern Valley is a real gem of an airstrip, located at the southern end of the Sierra Nevada around 37 nm north-east of Bakersfield. It’s an ideal starting point for budding backcountry pilots. Nestling between the mountains, the strip lies next to a lake and has its own campsite immediately adjacent to the runway. What more could a pilot ask for? And you won’t go hungry either! A small rustic cafe next to the airport serves delicious burgers in a cozy backwoods atmosphere. 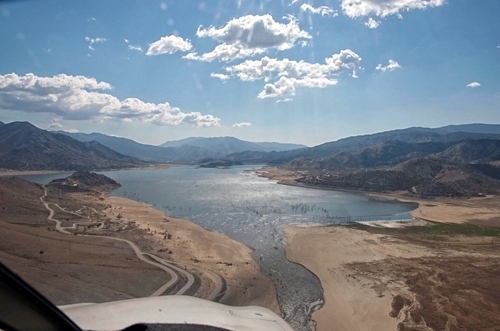 It’s best to approach the airport from the south, simply following the Kern River right to where it joins Lake Isabella. You will then be able to see the airstrip directly on the shore of the lake. The hire car available at the airport has the same rustic charm as the cafe building. It’s probably about 25 years old, but still well capable of taking you anywhere you want in the vicinity. 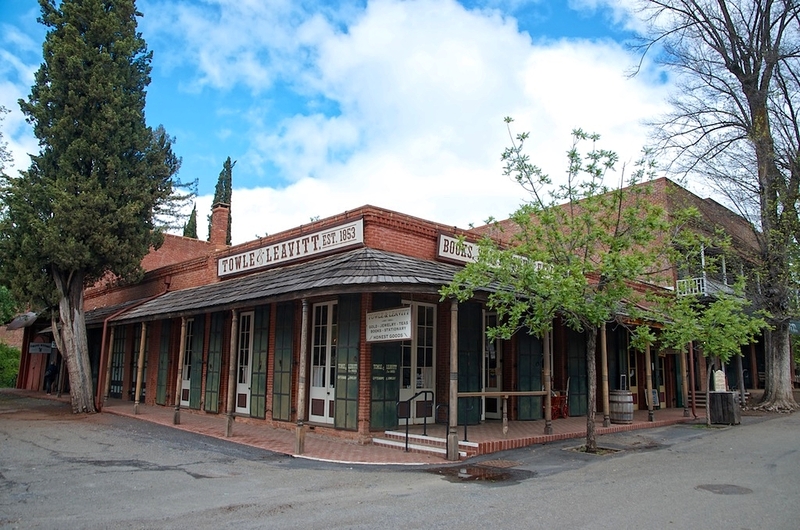 3 miles north of the strip is Kernville, a small Western township with several restaurants and great opportunities for kayaking on the Kern River. So why not enjoy a different type of trip with your “crew”! One thing to note: The last time I visited Kern Valley, the Avgas station wasn’t operational, but there were plans to re-open it in the immediate future. However, you might want to check on this beforehand. When asked what the capital city of Florida is, most people answer “Miami.” Wrong. 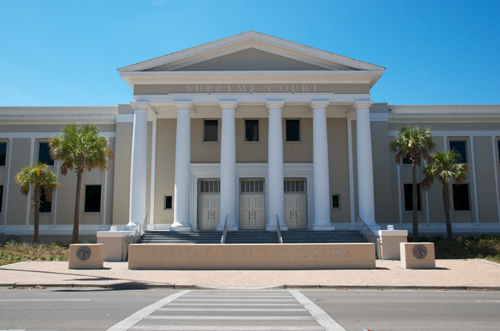 Tallahassee has been Florida’s capital since 1824. Perhaps this confusion is due to Tallahassee being off the beaten track, in the heart of the panhandle or perhaps it’s simply because people think it does not have big tourist attractions to offer. Well, nothing could be further from the truth. Embedded between lakes and national parks, Tallahassee is much more than just a center of government administration. It has a high number of museums, universities and colleges and, with Embry Riddle Aeronautical University located there, Tallahassee can boast a recognized training facility for upcoming pilots, aerospace technicians and engineers. The Mission San Luis is Florida’s Apalachee-Spanish living museum and brings to life the history of this early European and Native American settlement. The current mission was built on the site where the old Spanish mission was located. 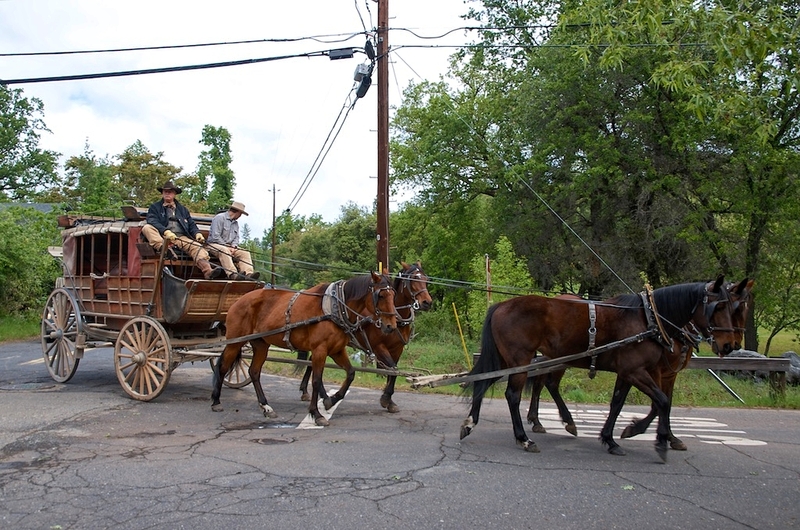 Almost all its houses are “inhabited” by people in period costume who transport visitors back in time to show them what life was like during the age of early European settlements. The Mission San Luis is just a 15-minute drive from the airport. 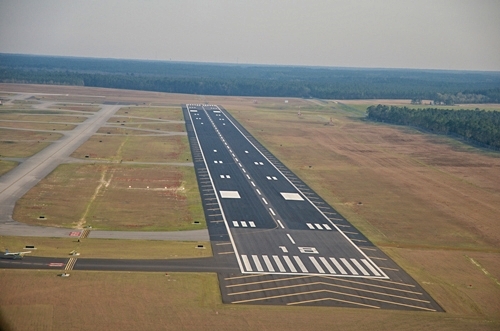 Though the Tallahassee Regional Airport is located in Class C air space, when it comes to air traffic density, it is more like a Class D airport on the east coast. However, you should become familiar with the landing and take-off procedures and, of course, print out your plate and have it on hand. 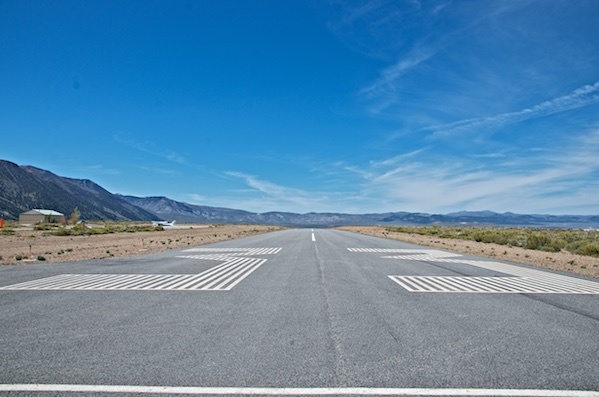 If runway 18-36 is active, the easiest way to get to the FBO is to ask for taxi via “J”. This helps you avoid potential zigzagging between the helicopters and business jets. The FBO at this airport, Million Air, is one of the top FBOs in Florida. Its services include courtesy and rental cars, quiet rooms, showers and even a pool table. 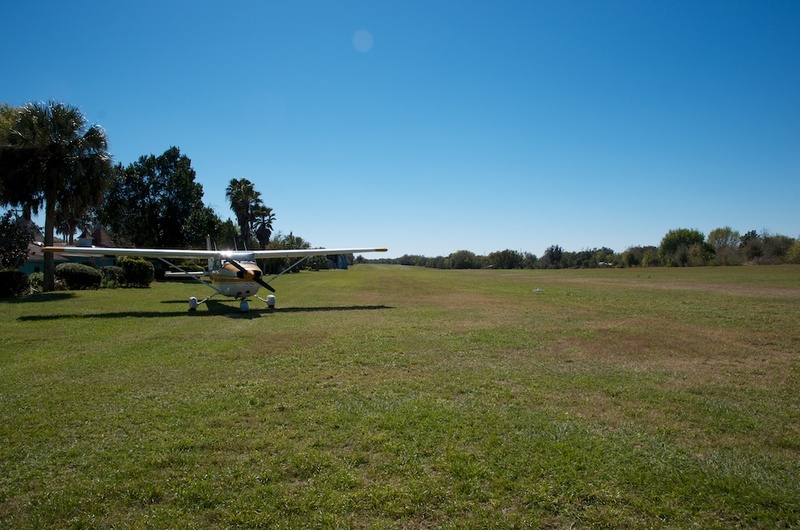 The River Ranch Resort Airport is in a wooded area, making it relatively difficult to identify when you are flying low on your way to River Ranch. A canal that runs east and parallel to the landing strip is a good reference point. Due to the adjacent trees, air turbulence often occurs at the end of the approach. Follow the right traffic pattern for runway 34. River Ranch is a terrific destination for the entire family. You can also plan a vacation here or even reserve for a long weekend. Accommodation options range from simple double rooms to self-catering cabins. You’ll notice right way here that it is no longer a real ranch with tilled fields and pastures with grazing cattle, rather this is a true resort operated by Westgate. If you don’t plan to stay overnight, it’s best to rent a golf cart to take a quick tour of the grounds. You can pick it up right at the runway and pay just $5 for 2.5 hours. The ranch is situated over a large area that includes a mobile home park, a golf course (9 holes) and a marina. There are plenty of places on the ranch to enjoy a good meal or snack. From the airport, it’s a 5 minute drive with the golf cart to the Westgate Smokehouse Grill at the other end of the street. It is open daily. There is also a pier where airboats can dock. Unlike its predecessors from the wild west, the River Ranch Saloon opens its swinging doors only on Fridays through Sunday evening. There is often live music, and dance classes are held there. The Ranch offers a plethora of outdoor recreational activities, including golf, air boat tours, horseback riding and clay pigeon shooting. One event not to miss is the rodeo evening held on Saturdays.